The Hidalgo County Regional Mobility Authority (HCRMA) on Tuesday, July 1, approved the Technically Preferred Alignment (TPA) for the proposed Hidalgo County Loop. The TPA was chosen in a unanimous vote by commissioners after engineering analysis by Hidalgo County Road Builders (HCRB), environmental input from PBS&J, the RMA’s environmental expertson the project, and public input gathered at five information open houses in May. The Hidalgo County Loop project will cost an estimated $650 million and will be financed partially from tolls. Burleson also announced a series of five more public meetings on the loop, which are designed to provide public feedback on the proposed TPA. These are scheduled to be held Tuesday, July 22, at Valley View High School in Hidalgo, Wednesday, July 23 at John F. Kennedy Elementary in Penitas, Thursday, July 24 at Donna High School, and Tuesday, July 29th at Edinburg North High School. The four regional information open houses will be followed by a county-wide session on Wednesday, July 30 at the McAllen Chamber of Commerce offices. Starting time for each open house is 5:30 p.m.
Generally known as the Hidalgo County Loop, the project is needed to help move truck traffic from the international bridges in Hidalgo County to the Free Trade Zone and away from the urban areas to cities in the north. U.S. Senator Kay Bailey Hutchison, R-Texas, a member of the Transportation, Housing and Urban Development (THUD) Appropriations subcommittee, on Thursday, July 10, successfully secured her amendment in a transportation spending bill that would continue the current ban on placing toll booths on interstate highways in Texas through September 2009. In 2007, Hutchison successfully passed legislation that prohibits the tolling of existing federal highways in Texas built with taxpayer dollars. Hutchison’s amendment passed and was signed into law as part of the Fiscal Year (FY) 2008 THUD Appropriations bill. Efforts to toll newly constructed lanes or new highways would not be prohibited in Hutchison’s amendment. Hutchison on July 10 offered the amendment to this year’s THUD Appropriations bill to extend the prohibition. The THUD Appropriations bill was reported out of the Senate Appropriations Committee and is now ready for consideration by the full Senate. The University of Texas-Pan American celebrated a landmark decision on Friday, July 11, to join the Great West Conference, an all-sports league, which will provide a home for 11 of 14 UTPA Department of Intercollegiate Athletics programs. UTPA is one of six NCAA Division I independent schools to accept a membership into the Great West, a football-only conference since 2004, which most recently decided to expand its organization to an all-sports conference to include basketball, volleyball, baseball, and other sports. A press conference was held at the Visitors Center to announce UTPA’s membership. With the Great West expanding to an all-sports conference, Grom said the name and brand of the organization will be front-and-center throughout the year, rather than just during the football season. Grom said he credits former UTPA Director of Athletics Scott Street, who resigned from his post in May, for taking the initiative to start the talks with other independent schools and get the ball rolling on the development of the Great West. For Street, who currently serves as a special assistant to the vice president for the Division of Enrollment and Student Services, the announcement could not have come at a better time as he prepares to leave UTPA Aug. 31. “This is one of things when I came here three years ago that I wanted to accomplish, and that was to have us in a formal conference. It is certainly something we have accomplished and I’m glad that we can move forward. It is a good thing to leave behind,” Street said. Joining UTPA in the Great West Conference are Utah Valley University, The University of North Dakota, The University of South Dakota, Houston Baptist University, and the New Jersey Institute of Technology. The UTPA sports programs that will fall under the umbrella of the Great West include baseball, volleyball, men’s and women’s basketball, men’s and women’s cross country, women’s golf, women’s tennis, and women’s indoor and outdoor track and field. The remainder of UTPA’s athletics programs – men’s golf, men’s tennis, and men’s indoor and outdoor track and field – already compete in other conferences. Even though a conference schedule for the Great West will not officially start until 2009-2010, Street said this will be a good opportunity for UTPA to start working as part of conference and also use the resources available to help refine the athletics department. “Being in a conference will help develop rivalries, community interest and our standings will actually be in USA Today under the Great West Conference,” Street said. “I think this will help us in recruitment quite a bit as it will give student-athletes a better chance to play in post-season competition and a better chance to be recognized at a national level,” Street said. Dr. John A. Edwards, vice president for the Division of Enrollment and Student Services, said joining an athletic conference will also enhance school spirit and increase support of UTPA Athletics programs. University Interim Director of Athletics Ricky Vaughn said this is a momentous occasion in UTPA Athletics and he is looking forward to the many benefits that will be made available to the student-athletes, coaches, and the community, particularly the opportunity to compete for conference and post-season championships. “This is something that our student-athletes are very deserving of and we are finally able to offer this to them,” Vaughn said. “The Great West also will allow us to have a consistent home and away schedule, which will give our fans more home games to attend and lessen the travel that our athletic teams make. This is definitely an exciting time for us and we look forward to creating a new chapter in UTPA Athletics history by joining the Great West,” Vaughn said. For more information on UTPA Athletics, call 956/381-2221 or visit http://utpabroncs.cstv.com/. To learn more about the Great West Conference, visit http://greatwestconference.cstv.com/. Clinical trials are proving to be miracles for many people afflicted with life-threatening diseases like cancer. Often paid by medical company sponsors, clinical trials are research studies of people that follow a pre-defined plan involving investigational treatment, tests and extra doctor visits. Besides insufficient clinical trials, particularly in South Texas, another of the problems with these programs that we are addressing at the Legislature is determining who should pay for “routine costs” associated with clinical trials that frequently aren’t covered by either the sponsor company nor the health insurance provider. Routine costs involve doctor visits, tests and treatments that generally are covered by health insurance when associated with standard treatment. Only three percent of all cancer patients enroll in clinical trials statewide, meaning that 97 percent of cancer patients have no access to novel treatment. With a goal of lowering the cancer rate and finding a cure, during the 80th Legislature we passed legislation giving voters the opportunity to approve $3 billion in general obligation bonds over ten years (on the ballot as Proposition 15) to fund grants for cancer prevention and research that includes clinical trials. Lt. Gov. David Dewhurst recently appointed three members to the Cancer Prevention and Research Institute Oversight Committee, (including Mr. Lionel Sosa from San Antonio), created by Proposition 15 to oversee the Institute. The Institute will begin investing these funds in a number of areas that will decrease the incidence of cancer in South Texas, including education and prevention programs and research grants focused on basic, translational and clinical cancer research. Basic research is usually performed in a laboratory and is the earliest process scientists use to create new knowledge. Translational research uses animal models to determine if the new knowledge found through the basic science investigative process has a beneficial impact on animals with cancer. If the translational research studies are successful, then the new therapies are tested in human subjects (clinical trials). Clinical trials occur in four phases and involve different numbers of human subjects depending on the clinical trial phase. Clinical trials at phase one normally enroll 10-50 human subjects, hundreds at phase two, and thousands at phases three and four. “We certainly expect that the Regional Academic Health Science Center (RAHC) will, through the University of Texas Health Science Center-San Antonio (UTHSCSA), become the recipient of some of this money to conduct clinical trials in South Texas,” says Dr. Brian Herman, Vice President for Research at UTHSCSA. Currently UTHSCSA performs research at the Edinburg campus to determine if certain genes can predispose Hispanic individuals to certain types of mental illness and diabetes, and what if any may be the relationship between obesity and cancer. Clinical trials are also being conducted by Valley Baptist Hospital and some of the private physicians in the South Texas region. Dr. Gabriel Hortobagyi with the University of Texas M.D. Anderson Cancer Center reminds us that in the 1950s every child with acute leukemia died, and today thanks to clinical trials, more than 80 percent survive. And while many medical experts and patients believe that health insurers should cover clinical trial costs, the insurance industry resists any state mandates to do so. Furthermore, TAHP notes that since clinical trials are by definition experimental, they are generally not covered by insurers. Yet there are exceptions. Some insurers cover routine costs if determined to be the usual care that the member would have received outside of the trial. Hortobagyi defends the efficacy of clinical trials, explaining that they represent the final common pathway to validate and to test the progress in laboratory research to assure that they are effective, that they deliver what they are supposed to deliver and are safe for patients. We in South Texas anxiously await funding from the Cancer Prevention and Research Institute to expand clinical trials. As a member of the State Affairs Committee, my colleagues and I will work with the insurance industry on a compromise for coverage of routine costs. Rep. Verónica Gonzáles, D-McAllen, Hidalgo County Judge J.D. 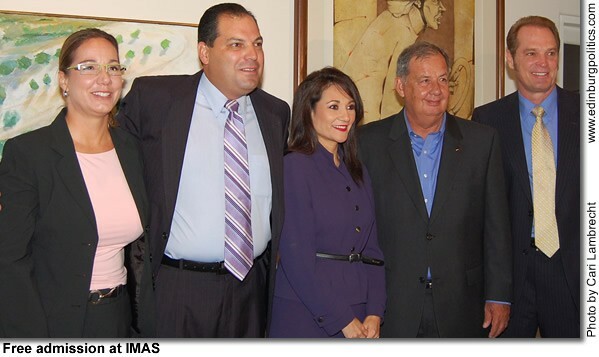 Salinas, III, and McAllen Mayor Richard Cortéz on Thursday, July 3, joined key International Museum of Art & Science (IMAS) leaders to announce the return of the free general admission program every Sunday for the next 12 months. The free general admission program, which will take place every Sunday from 3 p.m. to 5 p.m., began on Sunday, July 6. Complimentary general museum admission is available to all visitors, not just residents of McAllen. Gonzáles filed legislation in 2007, that was enacted into law, which allows the Hidalgo County Commissioners Court to appropriate county funding to IMAS. Gonzáles is facing fellow McAllen lawyer Javier Villalobos, a Republican, in the November general election for a two-year term to represent House District 41, which includes southwest Edinburg. Gonzáles, Salinas, and Cortéz were joined at the mid-morning announcement by Serena Rosenkrantz, IMAS executive director, and Dr. John Gerling, president of the IMAS Board of Directors. “IMAS is very grateful for this contribution being made by County Judge Salinas and our Hidalgo County Commissioners, as well as for all of the help we received from Rep. Gonzáles for authoring House Bill 2796 to make this program possible,” said Rosenkrantz. Sen. Eddie Lucio, Jr., D-Brownsville, was the Senate sponsor of HB 2796. 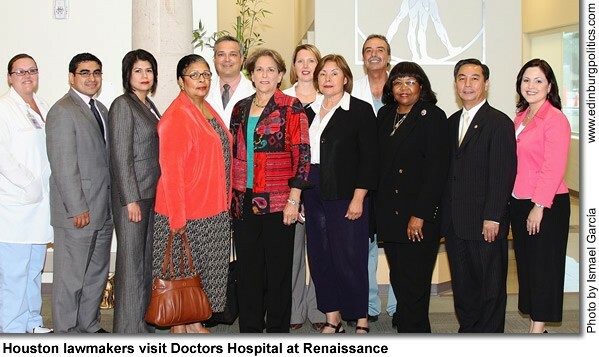 Cortéz emphasized that IMAS was a resource that strives to serve all Hidalgo County residents, from every walk-of-life. According to a bill analysis of the measure, in 2005, the Hidalgo County Commissioners Court considered funding the International Museum of Art & Science in the amount of $50,000. However, that law at the time did not grant counties the authority to appropriate funds for the purpose of financing museums. HB 2796 grants Hidalgo County the authority to operate and finance a museum in the county for specific purposes and to contract with private entities to perform services the county is authorized to perform. The museum continues to seek support from other local surrounding municipalities toward expanding these hours, year after year. For more information on this and other IMAS programs is available by contacting Rosenkrantz at (956) 682-1564. South Texas College Computer Aided Drafting and Design (CADD) Program students are experiencing the glitz and glamour of Hollywood-style movie production first hand. 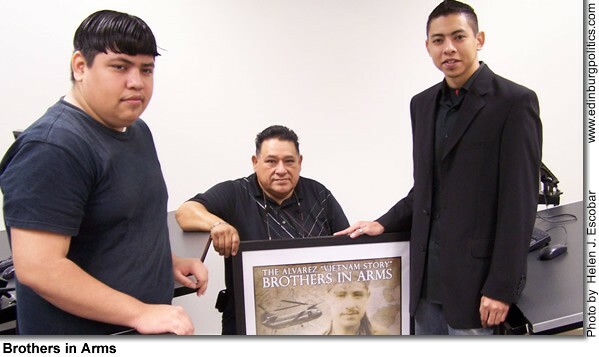 Two highly-skilled students have been chosen to design the movie poster and promotional binder for the film, The Álvarez Vietnam Story: Brothers in Arms. The film tells the true story of three Hispanic brothers, Emeterio III, Gilberto and Fernando Álvarez, who risked their lives serving in Vietnam. Fernando, the youngest brother, is a resident of Edinburg and is actively involved in the production of the movie. He invited students in STC’s CADD Program Digital Imaging classes to participate in the project by designing graphic layouts of posters for the film for review and possible selection. Students in all of the college’s Digital Imagining classes submitted work for consideration. Ultimately, brothers Frank and Joshua Jaramillo were selected to continue working on the project. The movie poster designed by Frank and Joshua was selected because it captured the essence of what the Álvarez brothers lived through in the Vietnam War. The inspiration for the making of the movie came from a letter written by Álvarez describing in detail everything that he and his brothers lived through while fighting in Vietnam. His letter was directed to the Veteran Affairs Administration discussing the impact of post traumatic stress. The movie serves not only as a tribute to the bravery of the brothers Álvarez, but also as a form of therapy for them and other Hispanic veterans. For more information about The Álvarez Vietnam Story: Brothers in Arms, contact Fernando Álvarez at 956/607-1472. For more information about STC’s CADD Program or Digital Imaging courses contact Rey Sánchez at 956-872-6103. Award-winning reporter/blogger/columnist Ramiro Burr has left the San Antonio Express-News to launch his own company, Ramiro Burr Communications. Burr’s move is the latest in a professional trajectory that includes stints as an entertainment writer, newspaper reporter, freelance writer, book author, and regionally syndicated columnist. Most recently, he was recognized as No. 1 blogger at Mysa.com. Burr says he is ready for the next level. “I will continue to write and blog about music. I think the community, especially the Latino community, is still underserved when it comes to news and information,” he said. “I have always emphasized the need for all media to be well-balanced and fully represent their communities, including the Latino community. By being inclusive, we are all enriched. • Baby Bash, ‘getting your digital game on right. Burr moderated two panels on these topics in the Pulso de la Musica Latina 2008: Get Your Digital Game On presented by The Recording Academy®, Texas Chapter in partnership with The Latin Recording Academy® at the St. Anthony Hotel in June. In March 2008, Ramiro Burr received a Philip True Award from the San Antonio Express-News for Online Impact. Burr’s popular Latin Notes Now blogs received 750,000 hits in 2007, more than any other Express-News/Mysa.com blog including the San Antonio Spurs, Dallas Cowboys, traffic and weather blogs.In April 2008, the LNN blog scored No.1 again with a record 191,000-plus hits- twice over the next blog. Mysa.com is San Antonio’s largest Web site, today registering over one million hits a month. Burr is now continuing his daily news stories, blogs, photos and updates at http://www.ramiroburr.com. In 1999, Burr wrote the groundbreaking Billboard Guide to Tejano and regional Mexican Music book by New York publisher Billboard Books. It is the genre’s first-ever sourcebook. Burr was also a contributor for several books, including World Music: The Rough Guide by the London-based Rough Guides, Hispanic Almanac on Visible Ink Press, and Puro Conjunto by the University of Texas Press. For almost two decades, Burr’s weekly music columns, syndicated as Ramiro Burr’s Latin Music, have appeared in several Texas newspapers including the Houston Chronicle, Dallas Morning News, Austin-American Statesman, Fort Worth Star-Telegram and the Laredo Morning Times. Burr will continue his work as a freelance writer, book author and online reporter published by various publications. Burr is currently working on two book projects. The first is a history of mariachi/rancheras for University of Texas Press. The second is a Spanish-English translation of Mexican singer/actress Judith Chávez’ polemic book, Como carne de cañón – Like cannon fodder – (the crude reality of show-biz) to become a major script in the movie industry. Through his experience, Burr has become a professional speaker whose insight and analysis of music, journalism, culture and the arts has been sought by colleges and civic groups including the Smithsonian Institution, Bowling Green University, University of Texas, Rice University, the University of Houston, and others. 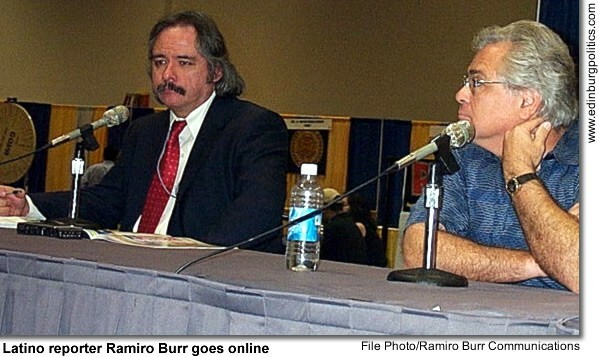 In 2000 and 2001, Burr won the Speaker of the Year award from the Hearst/San Antonio Express-News volunteer corp.
To keep up with Burr’s daily news stories, blogs, photos and updates, visit http://www.ramiroburr.com. 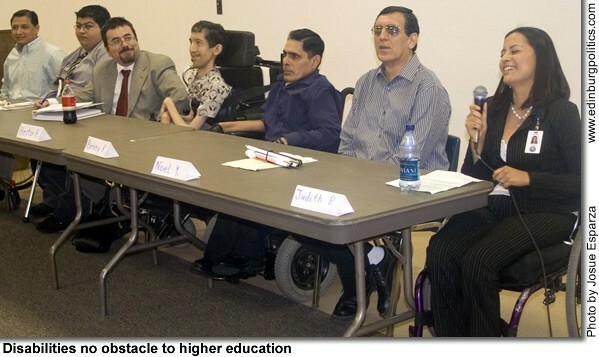 A recent seminar presented at The University of Texas-Pan American offered Rio Grande Valley disability service professionals as well as individuals with disabilities an opportunity to learn more about benefits and services available locally to enable individuals with disabilities to obtain a higher education. The “Disability Benefits and Return to Work” seminar, co-sponsored by the UTPA Department of Rehabilitation Addiction Studies Project, Workforce Solutions and the Texas Department of Assistive and Rehabilitative Services (DARS), covered Social Security Administration (SSA)’s disability benefits and return to work considerations and incentives. It also held a session highlighting individuals with disabilities who had been on SSA disability benefits but have successfully transitioned to higher paying professional jobs by obtaining higher education. “Individuals with disabilities have the highest unemployment and poverty level of any minority group in the nation. By having a role model to demonstrate that obtaining an education is possible, more people with disabilities can become educated, employed, and lead more fulfilled lives,” said Maureen McClain, associate director of Disability Services at UTPA, who participated in the seminar. McClain said UTPA is an accessible campus and provides a wide variety of adaptive equipment for students with hearing, vision, mobility, learning and psychiatric disabilities. This assistive technology includes adjustable computer stations; computers with speech output, screen magnification, and print and Braille output; JAWS software which reads books aloud; closed circuit TV magnification systems; and FM listening devices for the hearing impaired. Students who qualify can also benefit from the services of readers, scribes and note takers, who provide assistance during test taking or taking class notes, as well as sign language interpreters who can be with eligible students in the classroom. In addition, the UTPA Office of Disability Services provides information on scholarships that are available to those with disabilities. Becoming paralyzed in her lower extremities from a gunshot wound in 1998 did not stop seminar panelist Judith Pérez from obtaining not only a bachelor’s degree in rehabilitative services in May 2002 but a master’s in rehabilitation counseling in December 2003 – both from UTPA. For the past four years she has worked as a rehabilitation counselor in the DARS Division of Rehabilitative Services. Pérez talked about the significance of the support she received in pursuing her studies and particularly appreciated that accessibility was not a problem on the UTPA campus. “I was very fortunate that the campus was very accessible as far as ramps and elevators. I also found that the Department of Rehab had automatic door openers which were very useful for me to get into their main office,” said Pérez, who uses a wheelchair. UTPA is also one of a number of community partners in a three-year project called Project RISE (Regional Initiative for Supported Employment) to increase employment opportunities for high school seniors receiving special education services in area high schools by connecting them to Workforce Centers, DARS, higher education institutions and other adult service agencies. One of the objectives of Project RISE, an initiative of Workforce Solutions funded by the Texas Council for Developmental Disabilities, is to increase these students’ awareness about courses of study and available support services to help attain self-sufficiency said Jayshree Bhat, Project RISE director, who moderated the success story panel at the seminar. “During campus visits, they (students) learn how to tap into disability student services available at higher education institutions to help them succeed in college,” she said. McClain said the seminar provided a great opportunity to reach out to a segment of the population that has great potential. For more information, contact McClain at 956/316-7092 or via e-mail at maureen@utpa.edu. Texas is America’s Top State for Business according to the results of a CNBC study that scored each state on 40 different measures of competitiveness. Gov. Rick Perry joined CNBC’s “Closing Bell with Maria Bartiromo” in Washington, D.C. this afternoon for the announcement. CNBC’s ranking adds to the growing list of accomplishments and accolades for Texas’ business climate. The Lone Star State is now home to more Fortune 500 companies than any other state in the nation, and was recently named the “Best State to Do Business” by CEO Magazine for the third year in a row. In the past five years, Texas has created 1.2 million net new jobs. In the last year alone, more than half of all jobs created in the United States were in Texas. CNBC scored each state using publicly available data to determine the rankings. States received points based on ten broad categories including: cost of doing business, workforce, economy, education, quality of life, technology and innovation, transportation, cost of living, business friendliness, and access to capital. Texas’ strongest showings were in economy, technology and innovation, transportation and cost of living. The complete study is available on http://www.topstatesforbusiness.cnbc.com. The Senate Transportation and Homeland Security committee met in El Paso on Wednesday, July 9, to hear testimony from local and state officials on the security of the border between Texas and Mexico. Border security and its antecedent issues like drug trafficking and illegal immigration have leapt to the forefront of national policy debate in the past few years. State legislatures across the country have debated more than a thousand bills relating to border issues, according to National Conference of State Legislatures official Anne Morse. Much of this legislation deals with the state’s role in enforcing federal immigration policy. One Texas community that has developed a successful program to deal with illegal immigrants who commit crimes in the U.S. is found far from the border. Irving Chief of Police Larry Boyd testified about his city’s program to check the immigration status of all individuals arrested, either for misdemeanors or felonies, and then contact Immigration and Customs Enforcement (ICE) officials, who have jurisdiction over illegal immigrants. Boyd said his officers in the field do not check immigration status. Asking patrolling police officers to enforce immigration policy would be a dire mistake, according to El Paso County Attorney José Rodríguez. Successful policing depends on trust between a community and officers, he said, and if immigrants are more concerned about deportation than helping to catch criminals, witnesses become more reluctant to step forward. Victims of domestic abuse, marital, child or elder abuse, are often afraid to contact the police for fear of facing ICE officers, Rodríguez said. Just across the border from El Paso is Juárez, Mexico, a community that has seen hundreds of murders this year relating to drug trafficking and gang violence. El Paso, however, has one of the lowest crime rates in the country for a city its size. This can be attributed, according to FBI Agent in Charge David Cuthbertson, to the close cooperation between agencies at all levels of government. He says FBI, DEA, Border Patrol, state troopers, local law enforcement and others all work in close concert, sharing information across jurisdictions, to increase border security. The Senate Transportation and Homeland Security Committee is chaired by Sen. John Carona, R-Dallas. The other Senate panel members are: Sen. Kirk Watson, vice-chair; Sen. Tommy Williams, R-The Woodlands; Sen, Kim Brimer, R-Ft. Worth; Sen. Rodney Ellis, D-Houston; Sen. Florence Shapiro, R-Plano; Sen. Eliot Shapleigh, D-El Paso; and Sen. Robert Nichols, R-Jacksonville. A brazen, new spam e-mail featuring Texas Attorney General Greg Abbott’s photograph and the Office of the Attorney General’s Web page banner has recently hit inboxes statewide. Savvy e-mail users have increasingly learned to identify and delete fraudulent e-mails that falsely appear to originate from legitimate banks, credit card companies and government agencies. Recipients should not respond to the sender or click on any Web links that may appear within the message. Activating Web links that appear in unexpected e-mails may direct users to fraudulent Web sites or allow identity thieves to capture users’ sensitive personal information. A federal jury has convicted Erik Alfredo Constante, 21, of Mission, of bank fraud and theft or embezzlement by a bank employee, United States Attorney Don DeGabrielle announced on Friday, July 11. Constante was found guilty on both counts of two-count indictment on Friday afternoon in U.S. District Court in McAllen. Constante was convicted of theft or embezzlement by a bank employee in addition to defrauding International Bank of Commerce out of approximately $100,000 in U.S. currency. United States District Court Judge Randy Crane set a sentencing date of Sept. 23, 2008. Uncontroverted evidence at trial proved that on March 19, 2008, Constante was employed as a sales associate at International Bank of Commerce and, without authorization, forged the signature of a bank customer on a withdrawal slip and withdrew approximately $100,000 from the customer’s bank account. Constante, who testified at trial, never denied the forgery nor taking the money without the customer’s consent. He claimed, instead, that he had been threatened and coerced into taking the money by persons he believed to be members of the gang known as “Los Zetas” and had handed the money over to one of them. On cross-examination, Constante admitted he never informed his family or his grandparents of the alleged threat and to having spent some of the money himself. Further, evidence provided by bank employees proved Constante never alerted fellow employees that he was or had been threatened in any manner by anyone. Lastly, a search of Constante’s residence following the withdrawal resulted in the recovery of an International Bank of Commerce bank bag and a strap that was used to bundle some of the cash taken from the bank. The investigation leading to the indictment was conducted by agents of the United States Secret Service. The case was prosecuted by Assistant United States Attorney Robert Wells and Patricia A. Rigney.